With over 300 beaches, you are spoilt for choice in Cornwall. With family friendly beaches as well as those suitable for swimming, windsurfing and sailing, you’ll soon discover your own favourite. 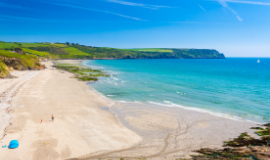 This incredible wide, white-sand beach is an easy journey from Trewhiddle, either by bicycle or walking boots via the Pentewan Valley Trail or by a short drive. It’s gentle waters are excellent for swimming and all water sports including surfing, water-skiing and sailing. PET FRIENDLY: Dogs not permitted from 1st March – 1st November. PARKING: At the rear of the beach, is a large, paid car park. 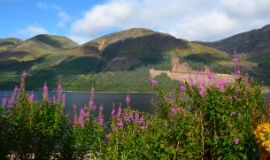 FACILITIES: There are toilets and refreshment facilities at the campsite to the rear, plus a slipway. PET FRIENDLY: Dogs not permitted from Easter Sunday – 1st October. PARKING: There is a large, privately owned car park. FACILITIES: There are toilets and refreshment facilities on the promenade. Newly revamped and home to beautiful white sands and incredible views, this 2-mile long stretch is now home to a fantastic line-up of events throughout the summer. Expect swaying palms, twinkling lights and a relaxed atmosphere. PET FRIENDLY: Dogs not allowed at any time. PARKING: There are large car parks close to the beach. PET FRIENDLY: Dogs are welcome all year. PARKING: There is ample parking along the beach front and a car park nearby at East Portholland. At West Portholland there is a small National Trust car park by the beach. FACILITIES: Public toilets and a cosy cafe! This tiny beach, just west of Fowey, is found nestled at the end of a rather narrow country lane. However, don’t be deterred by the slightly tricky access, this sheltered beach is a hidden gem and home to the iconic Sam’s On The Beach. It’s perfect for families and was once home to Daphne du Maurier. PET FRIENDLY: Dogs are not permitted from Easter Sunday to 1st October. PARKING: Paid car park on entrance road. FACILITIES: Public toilets, shop, café and pub can all be found close to the beach. Toilets just up the slipway too. Backed by the stately Caerhays Castle and it’s magnificent gardens, this public beach is perfect for an afternoon picnic. Swimming here is relatively safe, with a sheltered harbour, and to maintain the peaceful atmosphere there is a ban on any motorised watersports. PET FRIENDLY: Dogs welcomed all year. PARKING: Large car park directly behind the beach. FACILITIES: Visitors have access to a small shop and toilets. Gorran Haven is a pleasant sandy beach nestled just in front of the village with the same name. It is fairly sheltered, with historic roots dating back to the 19th century pilchard trade. PET FRIENDLY: Dogs welcome all year. PARKING: Parking for the beach and village is provided by a large car park a few hundred metres up the road. 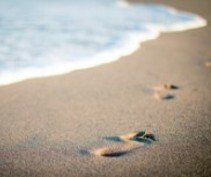 FACILITIES: The beach is right on the seafront and you have all the facilities of the village close at hand. There are public toilets just up the slipway too. Polzeath combines a beautiful sandy, blue-flag beach, laid back village vibes and ideal conditions for learning to surf. The beach itself is enormous at low tide, extending around half a mile in all directions. Polzeath is one of the safest beaches along this stretch of coast with its gently shelving sand and seasonal lifeguard cover. FACILITIES: The beach is right on the seafront and you have all the facilities of the village close at hand, including cafes, supermarkets, restaurants and surf schools. Bordered by sand dunes, this beautiful sheltered beach boasts spectacular views all the way across the Camel Estuary to Padstow. A haven for watersports, this beach is also perfect for swimming due to the gently sloping sands. PARKING: Large, paid car park to rear of the beach. FACILITIES: There is a small convenience store at the back of the car park that sells drinks, ice-creams and other handy items. At the heart of Cornwall's thriving surfing scene, Fistral is a breath-taking wide expanse of golden sand with powerful waves. Adjacent to the iconic Headland Hotel and the Newquay links golf course, here you can kick back at one of the surf bars, find your feet on the board, or just explore the Pentire Headland for epic views. PARKING: There is a 250 space car park at Fistral - the charges vary throughout the year. FACILITIES: The northern end has plenty of facilities including the Surf Centre, toilets, cafes, surfboard and wetsuit hire and the lifeguard station. Famous for it's ginormous sand dunes and small river that meanders down to the sea, Holywell Bay is a firm favourite for those holidaying in North Cornwall. The sand is beautifully soft and dotted with shells, and the huge expanse of beach is perfect for families. The name Holywell is derived from holy well and it is believed this refers to a cave at the northern end of the beach. Only accessible at low tide (so take care) the cave contains an unusual rock formation which creates a series of basins. PARKING: National Trust car park at the rear of the dunes. Charges vary. FACILITIES: The village boasts numerous pubs and convenience stores. There is also a lifeguard station directly on the beach. Stretching out in front of the picture-perfect Crantock village, at the mouth of the Gannel estaury, this idyllic beach offers a stark contrast to Newquay and is a great choice for those looking for a peaceful alternative. This beach is a haven for wildlife and a sanctuary for seabirds so keep your eyes peeled! PARKING: There is a beach car park in the town or use the Bowjie Inn car park. Alternatively, park up on the Pentire Headland. FACILITIES: Beach kiosk serving refreshments during the summer months.